On Wednesday last week, there were auditions for the movie everyone’s talking about – the movie for Chimamanda’s Adichie’s seminal book Half Of A Yellow Sun, driven by Nigerian writer and film maker Biyi Bandele. Shooting is scheduled to begin around March and our actors dusting up their knowledge of the novel, waiting for auditions and casting calls. But what would a movie about the Nigerian Civil War be without some controversy. So, some good people have started a petition that Hollywood actress Thandie Netwon should not be “allowed” to play the lead role of Kainene because she is not Nigerian in what is a uniquely Nigerian tale, and if you would have it, she is too “yellow” to be Igbo. Unfortunately, there are at least 7 reasons why it is very unlikely either Omotola or Genevieve would be displacing Newton anytime soon. At the end of the day, the movie-making business is a business, and there is not enough money in Nollywood as it stands now to make this film. None of our existing producers or our marketers can muster the amount of funding that will give Bandele peace of mind, which means he has to go to foreign financiers. Unfortunately, in Hollywood it’s all about being bankable, and as our stars are still local champions (sorry, selling to Africans Diaspora doesn’t count as ‘international’), no investor outside our shores is likely to put his money on them selling his films. Bola Tinbu reportedly put his money fown to bring Fela! The Musical to Nigeria. Is he ready to do the same for this Igbo story? How about Jim Nwobodo? Bianca Ojukwu? Nduka Obaigbena? Anyone? This movie will be watched by an international audience ultimately – as it is not a Nollywood film, and it will aspire for Hollywood’s attention going by the track record of Bandele’s team (his wife and partner was behind the Ugandan story Last King of Scotland). Is there any of our female leads here that Americans will want to watch? My bet is it’s a no. There’s a reason why all our ‘international’ movies from Ije to Amazing Grace were essentially acclaimed only by a local audience or by a narrow cinema of foreigners. 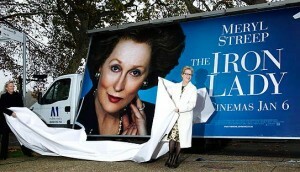 There’s a reason why Meryl Streep was Margaret Thatcher in Iron Lady or Forest Whittaker as Idi Amin. It wasn’t for lack of access to Judy Dench. People want stars they know. You want the truth, the whole truth and nothing but the truth? Our stars aren’t yet on the top of their games – exactly why the entire Genevieve Nnajji James Bond tale was one joke taken too far. Seriously, have you seen our actresses enunciate? Yes, Genevieve has gone father than, say, Uche Jombo, but still. The reach for accents they cannot master, the cultural factors that haven’t been un-learned, over-acting peculiar to Nollywood, a living out of typecasting… I could go on and on? If I was an international movie producer not interested in developing Nollywood – which these guys are – I will only go for actors that work. 4. Are our stars ready to audition? Some people will say this is moot as everyone from Kanayo O. Kanayo to Patience Ozokwor was at the auditions last week. But pay close attention – we are talking Thandie Netwon here. Can you truly imagine our female lead super-stars lounging around the offices of Seke Somolu waiting to be auditioned for the role? Just imagine it – Rita Dominic, Genevieve Nnaji, Omotola Jalade-Ekeinde… who else is a star? Well, you get the picture. Our Nollywood has gotten so big yet gotten so small that perhaps we have killed the potential for our stars before they can really spread their wings. Which would be sad. The truth is that like most things in the world – it’s those who know how to strategically make their cases that get things done for their interest groups. It’s the reason we have associations, lobby groups and the entire works. What do we have here? The Actors Guild of Nigeria? Seriously. I doubt they have the capacity for anything else but arguing over positions in the guild. Influential artist managers like Mildred Okwo and Emem Ema are able to form a powerful lobby for those they represent – but in our Nigeria at the moment, there are not enough of them for a major upheaval. We also don’t have powerful film critics and others who will make production so uncomfortable for the film-makers that they have no choice but to give us that role. Anyone willing to change this? The guys who wrote up that pesky petition complained majorly that Ms. Newton is too ‘yellow’ for the role and would therefore put a burden on “African women” to aspire to those complexion demands. And lord knows we have a bleaching problem in our land! For real? Now, there are all kinds of things wrong with this – especially since, for instance, our dear Rita Dominic is as “yellow” as they come – but let’s leave the patronising tone. In these days of Hollywood technology, is there such a thing as a person “too yellow” that a little post-production cannot take care please. Spare me. This is the one that is ‘paining’ me. Excuse me, why would you give another man the burden of meeting your expectations for his own creative work? We all have had this book in our hands for years now, and no one moved. Now someone has taken the steps to tell a story that we have refused to tell – and now we have woken up with demands? Like Nigerians will say, if you no like am, go and do your own! Uj, I feel you but all these names u've listed have one foreign influence or the other….grew up in London, raised in Washington..etc, so I bet u they're probably no more Nigerian than thandie Newton. I appreciaite your analysis and I quite agree with the fact that nollywood actresses may not be competent enough to handle the part or even be bankable stars. However here is a list of Nigerian international actresses and the movies they have been in. Rhetorical article I must say but you may want to try editing your write-ups before you have them published. I'm seeing too many typographical/grammatical errors that could make this article look like it was written by a juvenile. Hauwa, God bless u for this!!! Cos we have practically lost it in Nollywood! 2-3weeks movies just so they can grab quick pay and go run their respective business, thereby, compeletely and shamelessly destroy the meaning/essence of ART, drama,motion pictures etc! Pls like u asked, where were all theses jokers throwing tantrums before now? Mscheew! This is an international movie, if they can even get a redhead to live and act the role, WE WILL APPRECIATE IT, see the movie at cinemas and buy it!! Well written. It's an international film. We can only hope the film producer is gracious enough to consider an igbo actress. I love Half of a Yellow Sun and agree with all the points (but the title's 10 and only 7 reasons given)! I can't even imagine any of the Nollywood overrated and overblown 'stars' doing justice to the kind of screenplay this book would produce! Thandie Newton as Olanna would be fantastic! Thandie to play Olana is on point because Olana, as described in the book, is small chested which is similar to that of Thandie. Besides, I hope the movie turns out Fab! God bless you! Number 7 yen gangan ni point! Like you said, we've had this book for years! None of our Nollywood "greats" deemed it fit to turn it into a screenplay now some hypocrites have come up with "demands"! Pschew! Pls Mr. Bandele should ignore and go ahead with the production of what I know would be a hugely successful movie! He was behind "Last King of Scotland"?! WOW! Very impressive! PS Isn't Thandie supposed to be playing "Olanna"? Kainene is the twin sister who dated the white guy. What's his name now? Richard I think.